Do not use: if you ever had an allergic reaction to any other pain reliever/fever reducer. - Take with food or milk if stomach upset occurs. If pregnant or breast feeding, ask a health professional before use. 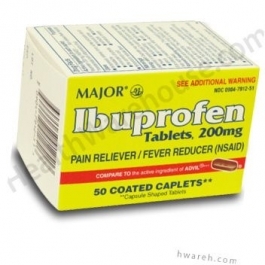 It is especially important not to use ibuprofen during the last 3 months of pregnancy unless definitely directed to do so by a doctor because it may cause problems in the unborn child or complications during delivery. Adults and children 12 years and older: take 1 TABLET every 4 to 6 HOURS while symptoms persist. If pain or fever does not respond to 1 TABLET, 2 TABLETS may be used. Do not exceed 6 TABLETS in 24 HOURS.